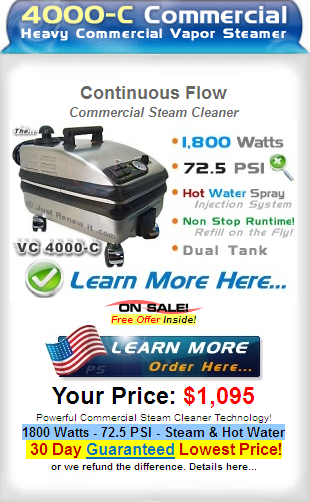 What is the Right Price for a Commercial Vapor Steam Cleaner? 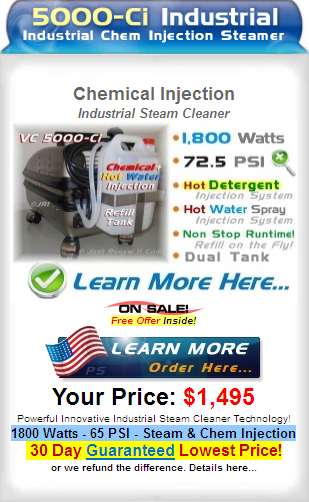 If you are looking at the price for a commercial vapor steam cleaner for your business, you will find that prices range from inexpensive to very expensive. There are a number of factors that go into determining what the right price is for you, although the old adage about getting what you pay for does hold true with such a purchase. It is necessary for you to go through the different options available to you when it comes to commercial vapor steam cleaners so you find the best price for your spending dollars. You want to make sure you get a machine that delivers, does what you need it to, and that you do not end up getting ripped off. 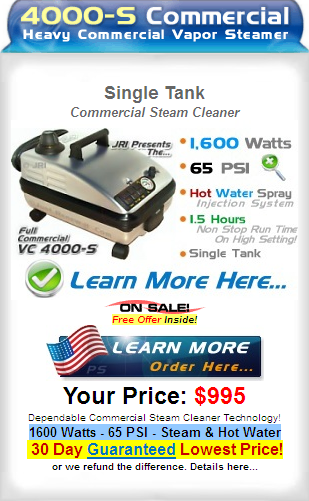 One of the first things you will want to do here is educate yourself about key elements to look for with a commercial vapor steam cleaner and what features you want and need for your business. There are regular steam cleaners and dry vapor steam cleaners on the market today, and these two are nowhere near the same. Sure, they both heat water for cleaning, but the similarities end there. Wet Steam or Dry Steam? The traditional steam cleaner or wet steam cleaner is what you often see on the shelves at a local home goods store. These are like big vacuums with a water component added in. They spray jets of water into carpet or upholstery and then have a suction hose and possibly brushes that go back and pick up the water. In reality, many leave a large amount of fluid behind. These units use a combination of water and cleaning chemicals to clean carpet and upholstery, although few have a heating unit. Even fewer reach a high enough temperature to actually produce steam. The steam cleaner, as most people know it, is ineffectually names and is more properly called a carpet cleaner. The old school industrial steam cleaner heats up water and produces pressurized jets of water to clean various areas. This is actually just a take on the pressure washer. There are models made for cement and roofs and outsides of buildings and some designed for indoor jobs like carpet and upholstery. Some are heated, although the majority of the heat often comes from running through the components of the pressurized pump and motor. This unit guzzles water, usually has a constant feed, and can create quite the mess, especially if used indoors. The pressure from these units can cause damage in more delicate areas or on a variety of materials. It is a quick and dirty way to get things clean, often combines cleaning detergents, and has its uses, but inside the office, storefront, or warehouse is typically not one of them. The dry vapor steam cleaner is the real deal. This is the only type of unit on the market today that actually uses pressurized steam to clean a variety of surfaces. These machines should heat the water temperature up to about 180 degrees Fahrenheit or better at the active end. Some units will claim temperatures well in excess of that, but they are more than likely referring to the temperature within the boiler. These units are used to clean and sanitize areas both inside and outside the office. Because the water is pressurized and heated to such a temperature with an industrial dry vapor steam cleaner, the nozzle end is ejecting a steam that is only about 95 to 98 percent steam. This leaves an actual moisture content of somewhere between 2 and 5 percent. That means that the unit can be used even around machinery and there is no worries of rust of other damage from water. The pressurized nature allows most cleaning to be done without additional scrubbing. However, if necessary, several attachments are available that can go on the end of the nozzle to help scour those really difficult stains. The high temperatures of the steam are what also allow for a sanitizing effect killing virtually all variety of germs and bacteria. That same high temperature allows the steam cleaner to break down molecular bonds between dirt, debris, and the surface being cleaned. Best of all, this can all be accomplished without the expensive and potentially harmful cleaning chemicals we would normally rely on. These units tend to use a gallon of water or less per hour, which means that it is an environmentally responsible purchase as well. There are a number of ways in which you can use a dry vapor steam cleaner. This would mean that while you are looking for an affordable steam cleaner for one job you might be surprised to learn that there are a number of jobs that it will help you to accomplish. In these times is there any wonder why people are using this type of steam cleaner for their cleaning needs. Not only are you generally able to find one that is not that expensive but you are able to find so many uses for it. For example, you might purchase this commercial steam cleaner to clean homes but you will also be able to clean cars as well. No matter what type of industry you are in there seems to be a use for a dry vapor steam cleaner. This machine will allow you to save money while improving the kind of work that you are doing. You will want to make sure that you talk to a specialist that is able to sit down and talk to you about the boilers of each model and help you find one that would best suit your needs. This would mean that you are able to find a steam cleaner that is not too big and not too small either. Find the right size commercial vapor steam cleaner for your business that has the proper warranty, accessories, and support is key to finding the best purchase for your company.